Creation Therapy, An S.A.C.C. Certification Course | Soul Care Ministries International, Inc. | Soul Care Ministries International, Inc.
Are you “called” by the Lord to counsel and minister to the needs of the hurting? Do you want to learn a Biblically based counseling model that is over 90% successful? This training that you need! This is a Biblically based course of study in Christian counseling that provides a transcript for three-semester hours of college level credit transferable to accredited Christian seminaries, colleges and universities. Creation Therapy is an established approach to counseling developed by Drs. Richard and Phyllis Arno, founders of the Sarasota Academy of Christian Counseling (S.A.C.C.). S.A.C.C. is a sister organization of the National Christian Counselors Association (N.C.C.A.). Creation Therapy deals with the inner man rather than outer manifestations or problems. Creation Therapy will teach you how to identify the “hidden” problems and how to counsel those who turn to you for help. This course was developed with ministers, chaplains, professional counselors and lay people in mind. Creation Therapy (a.k.a. Arno Profile System) is a counseling method based on the belief that man is a uniquely created being rather than the result of an evolutionary process. This method was developed during seven years of research involving five thousand (5,000) individuals who were seeking help for their problems. 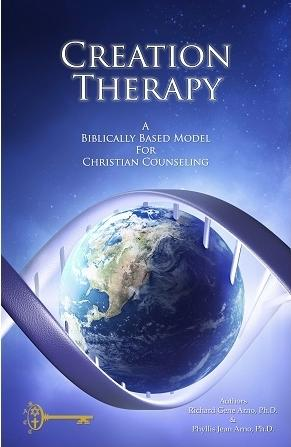 Conclusions based on research are that Creation Therapy is over ninety percent (90%) successful when administered by a person who has been trained in this counseling technique. This course provides an opportunity to learn about the divinely inspired research that resulted in the scientific discovery of a fifth temperament. Have you ever wondered why we do the very things that we know we should not and why we do not do the very things we know we should? This was one of the greatest things to perplex the Apostle Paul and it continues to perplex most present-day Christians. Creation Therapy works when other counseling methods fail. Why? Because rather than spending session after session in an attempt to correct “symptoms,” the counselor follows a step-by-step counseling procedure developed to “target” the source of the problem(s). Learn what causes relationship conflicts and how to resolve them. Learn the secrets of human behavior and how God’s wonderful plan works when understood and applied. Learn a very successful five-step method for counseling those who turn to them for help. Qualify to administer the Arno Profile System (A.P.S.) which identifies an individual’s “inborn” temperament rather than their behavior. This information helps the counselor identify the core problem and aid the counselee in problem resolution. Because of its’ effectiveness, A.P.S. Certified counselors are presently administering approximately 25,000 A.P.S. Reports per year. The Arno Profile System (A.P.S.) is a divinely inspired counseling tool that Christian counselors are successfully using to help the hurting all around the world. Learn about the divinely inspired research that resulted in the scientific discovery of a fifth temperament. Receive detailed, practical instruction on how to use the temperament as a means of providing accurate, insightful, and truly helpful counseling to those you work with. Become the professional God has called you to be. The course is provided in a distance learning/home study format and typically takes two to three months to complete. This counseling course includes: a video tape, textbook, workbook and Code of Ethics. The course is administered and graded by The Soul Care Institute℠. Persons who successfully complete the course qualify for membership in the S.A.C.C. Being a member of the S.A.C.C. provides authorization to administer and use the Arno Profile System (A.P.S.). Application for membership in the S.A.C.C. is required. There is a $25 application fee and $50 annual dues. Members of the S.A.C.C. can administer the Arno Profile System (A.P.S.) to those whom they are counseling, enter it in online for $30 and receive a 7-8 page profile on the individual being counseled. The counselee should be charged a minimum of $50 for this profile. Upon completion of the certification program, the software is made available online or may be purchased from S.A.C.C. Persons who successfully complete the Creation Therapy course, join the S.A.C.C. and administer the Arno Profile System to a minimum of ten (10) individuals may also qualify to enter into a program for certification or license in Christian Counseling. This course of study in Christian counseling provides a transcript for three-semester hours of college level credit that is transferable to accredited Christian seminaries, colleges and universities. Specific details and assistance will be provided by The Soul Care Institute℠ upon request. The tuition and fees for this counseling course is $299 + $15 standard S&H (optional CD-ROM version recommended for Non-US Residents at $399 including S&H). Download, complete and return the attached enrollment application. Thank you for your order. We look forward to serving you study and earn certification in Creation Therapy . Should you have any questions, please contact us.